The Converse Blog: The Converse Blog's Saturday Special. Just a little update for the weekend. I just saw where the 76ers have traded Kyle Korver to the Jazz for Gordan Giricek and a first round draft pick. I was anticipating a trade for one the Converse players on teh 76ers, but I thought it would be Andre Miller. Which of course this could still happen, a trade to the Cavs keeps coming up. For now though we can look forward to having a Converse player on another NBA team. 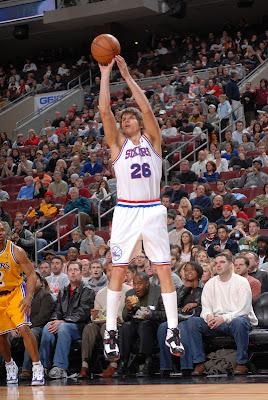 We may see some new PE's of the 099 but more likely we'll see Korver's first PE colorways in the Converse Hops.